As Arizona lawmakers consider the Gov. Doug Ducey’s budget proposal, the state’s public universities are evaluating the future of higher education spending. 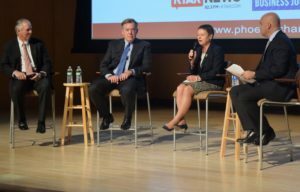 The Phoenix Chamber of Commerce brought the presidents together for a panel Tuesday at the Musical Instrument Museum in Phoenix. Arizona spent 55 percent less per student between fiscal year 2009 and 2018, according to the Joint Legislative Budget Council. Adjusted for inflation that’s $7,962 per student versus $3,572 per student. READ THE FULL KJZZ RECAP HERE.